Say it out loud. It's awesome, right? Now say it again but imagine it is cause by a large mystical sword of great power cutting off a random body part of a bad guy. Yeah. Bravo, Fables team. You've had me going SNICKER SNACK at random for nearly a month now. There's a bit of an unofficial pattern with the Fables graphic novels so far - every even number volume tells a concurrent story occurring at the same time as the story in the previous volume, just somewhere outside of Fabletown proper. Volume 4 muddles that pattern a little bit, but it splits its story between Fabletown and the Homelands enough to still fit. Like I said, it's an unofficial pattern. That just means that there is not much about Snow, her flying wolf babies, the Farm, Fabletown or the epic failure of Prince Charming as a government figure anywhere in Homelands. Instead we figure out what happened to Boy Blue, who sneaked out early on in The Mean Seasons with only a magic cloak and the epic Vorpal sword of SNICKER SNACK Through the Looking Glass fame. Homelands starts with a somewhat unrelated story revolving around Jack, of both Giant Killer and Candle Jumping fame. After being unofficially exiled for being the culprit behind nine out of every ten crimes in Fabletown, he heads to Hollywood to try his fate at opening a movie studio, backed with a vast fortune he'd stolen on his way out of town. I've never been that fond of Jack as a character, so seeing him succeed and then watching as everything comes crashing down was very satisfying. Bigby's hand in Jack's inevitable downfall made me giggle like a silly school girl. I love grumpy Bigby. But the star of this volume is Boy Blue and his epic adventure in the Homelands to find his lost love, Little Red Riding Hood, and defeat the Advisory so he and his friends can all return home. It turns out, Blue is kind of a badass, something you would have never guessed from his clerical duties in the mayor's office or his trumpet playing in the basement. He's also older than ten, which I had previously thought as he was drawn seemingly like a young boy. No, he's definitely a guy who can wield a sword and chop off heads of those who stand in his way. There's a lot of SNICKER SNACK-ing going on in this volume. I missed Bigby and Snow, but mostly Bigby. Even though Blue became a far more developed character and his epic quest was indeed of an epic nature, there wasn't the gruff sarcasm or logical instincts of the former sheriff. Instead it was a bit of a hearts-in-my-eyes quest of eternal love and devotion that, having read Blue's previous encounter with the real Riding Hood more than a year ago (possibly two), I didn't have a lot invested in. That's not to say that I couldn't appreciate his ingenuity and his playing of the long game. I loved seeing him be a smart vigilante even if it was only his own interests that he really had at heart, and I spent most of a three hour car ride with my nose firmly implanted in this comic (and with Cinder in my bag waiting to be started!). 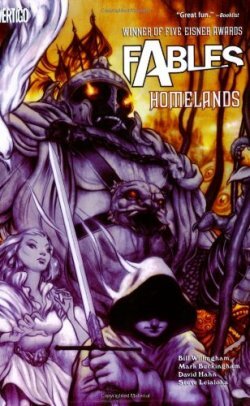 This is our first extensive look at the Homelands and how all these disparate fantasy worlds fit together. Considering this was something I pondered in the back of my mind whenever I read Fables, I'm glad to see that the various lands fit together in a somewhat logical yet completely random sort of way. We’re also introduced to the Adversary, for real this time. His background story and how he became overlord of all the fables’ homes actually makes sense, if only a little convoluted. It’s a faerie tale after all. Overall it's a satisfying reveal to the big bad that's plagued the characters for the last six volumes and I'm very curious to see how the reveal and Blue's return to Fabletown with affect everyone. Mowgli: Yeah, I had hopes of dancing on his grave while I’m here. Bagheera: You won’t be the first. Baloo did a week-long song and dance revue on it. Seven nightly shows and a Sunday matinee. It’s funnier in context. Trust me. But mostly - SNICKER SNACK!